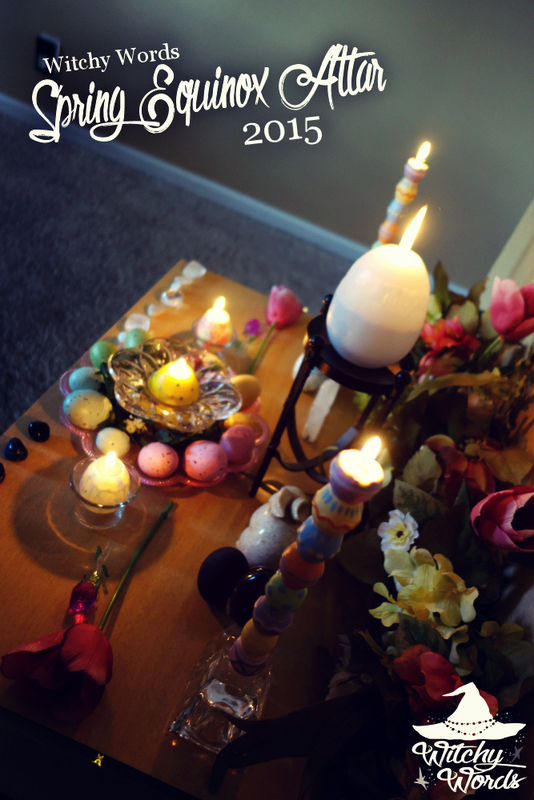 To see my 2014 Spring Equinox / Ostara altar, click here! 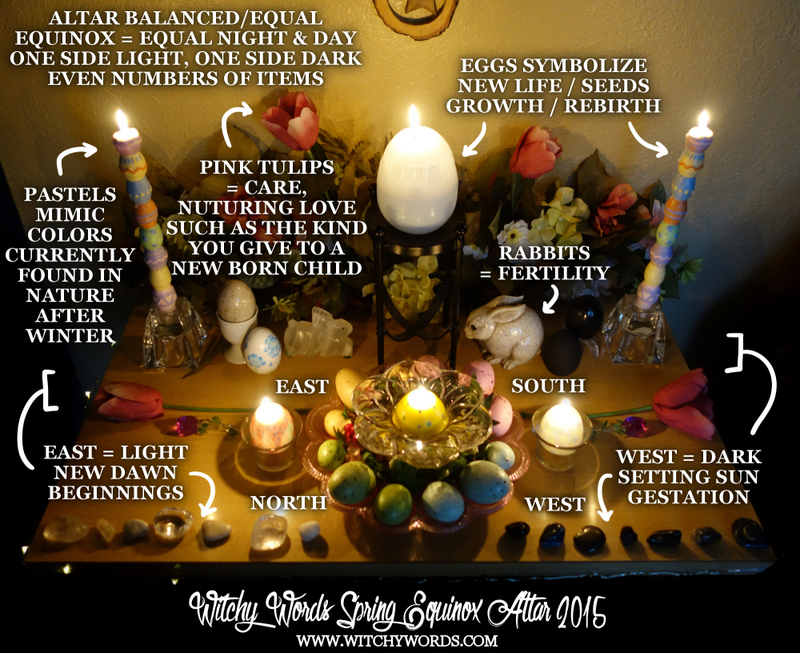 The vernal equinox is a sabbat of fertility, growth and new beginnings. 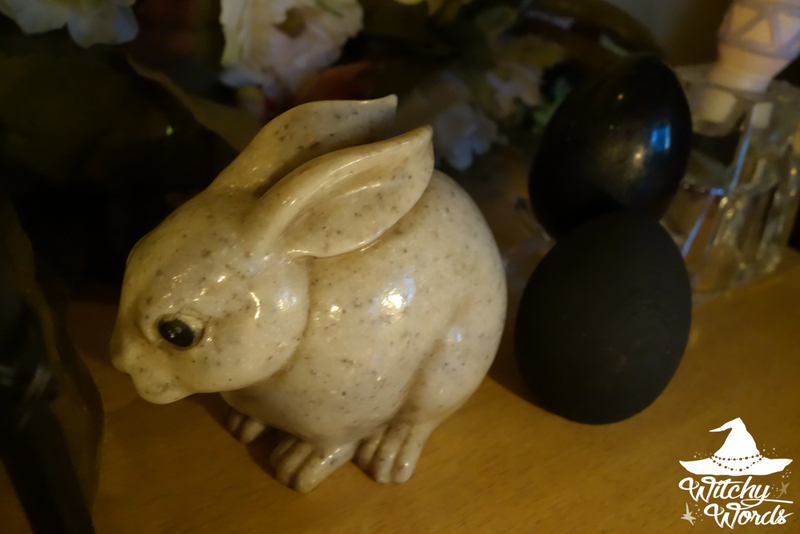 Marking equal night and day, each day after Ostara grows longer, warmer and more fruitful. It's now spring! That means it's time to sew your seeds, be it actual plants or the beginnings of a new venture in your life. Some celebrate this sabbat with the Germanic fertility goddess Eostre, who is associated with fertility symbols such as eggs and rabbits. 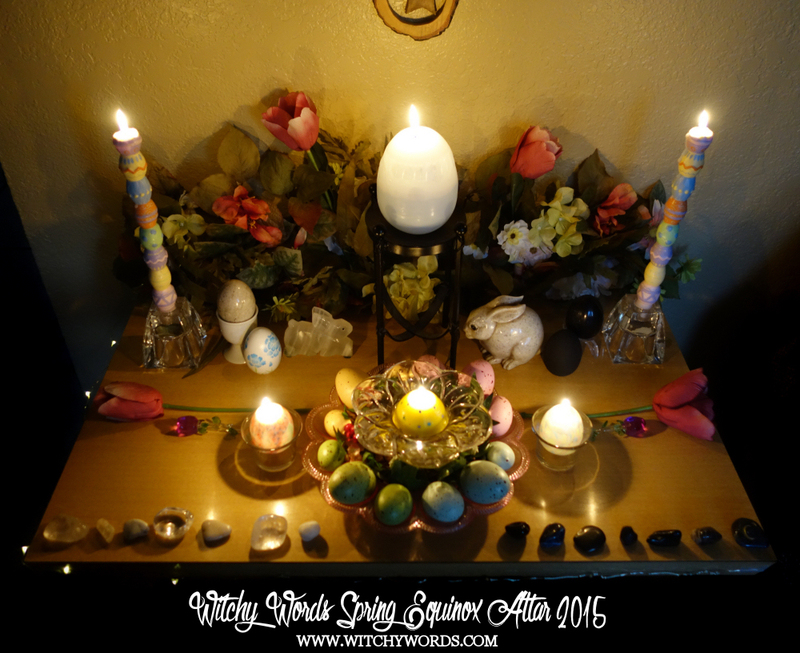 The items I've used on my Spring Equinox altar reflect these meanings. 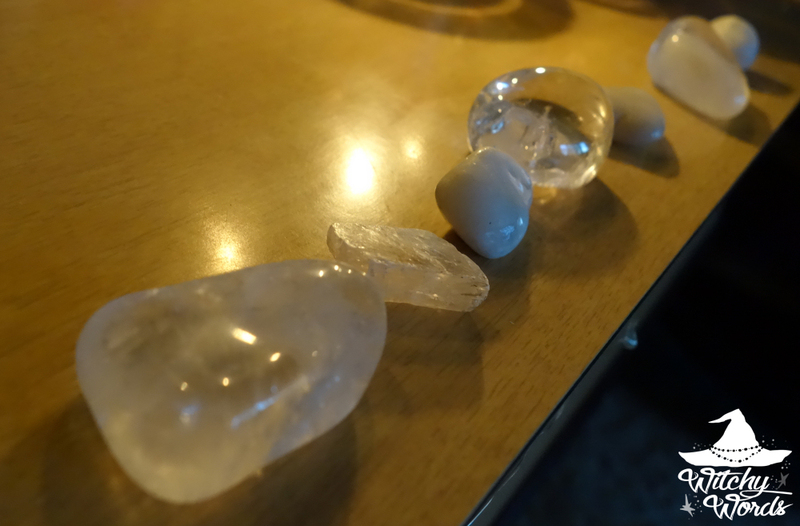 The seasonal decorations, stones and colors all point to the fertility of the land, rebirth and growth, new beginnings and nurturing your inner child. 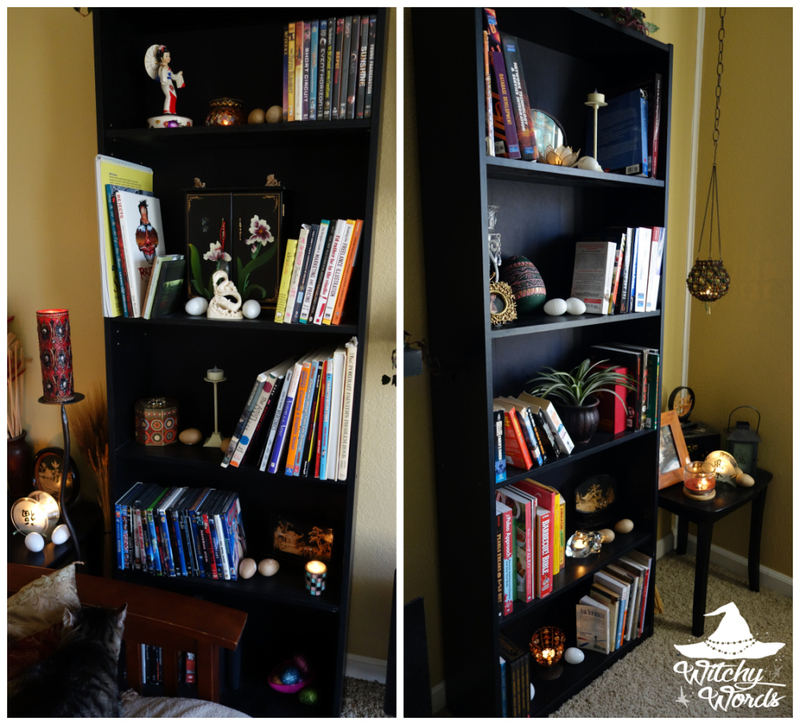 Here's a short visual explanation of my altar. 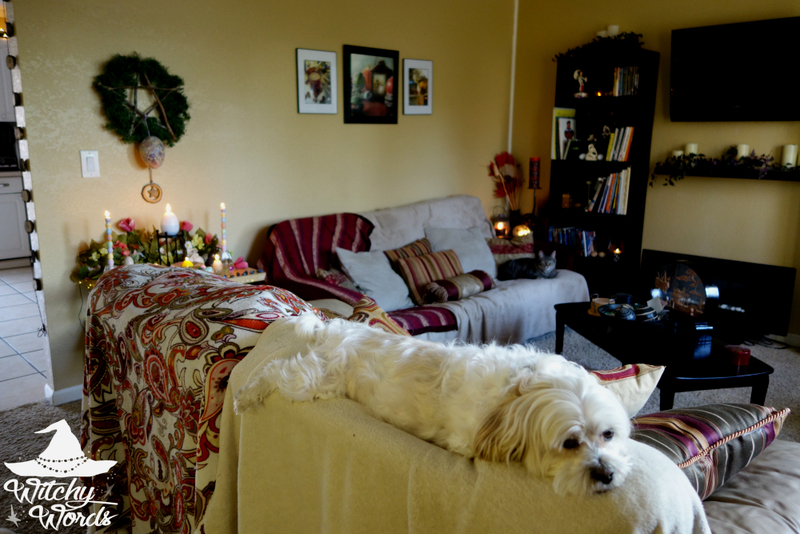 For more details, pictures and even some photos of my household decorations and familiars, look below! Let's begin with the main altar candle. What better representation of new life and sewing your seeds than the seed of animal life, the egg. 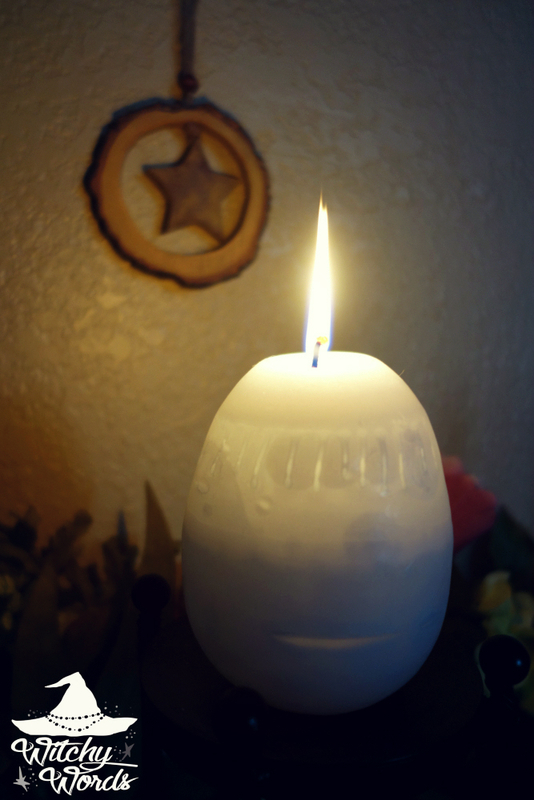 The amazing egg candle I'm using as the primary altar candle glows deep within while lit, which makes it a good fit for its meaning. 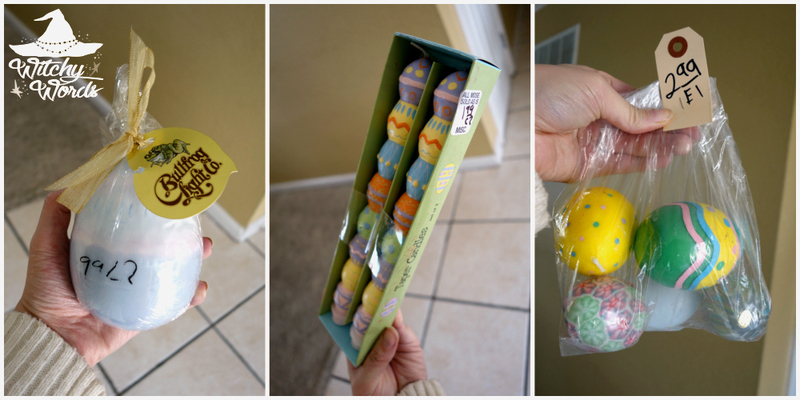 Along with the primary egg altar candle, I ran across these amazing decorated egg taper candles. I mean, just look at them! How perfect are they? The pastel colors in which they are painted represent the pastel colors we now find as flowers begin to bud. These colors will turn brighter as we travel closer to Beltane. 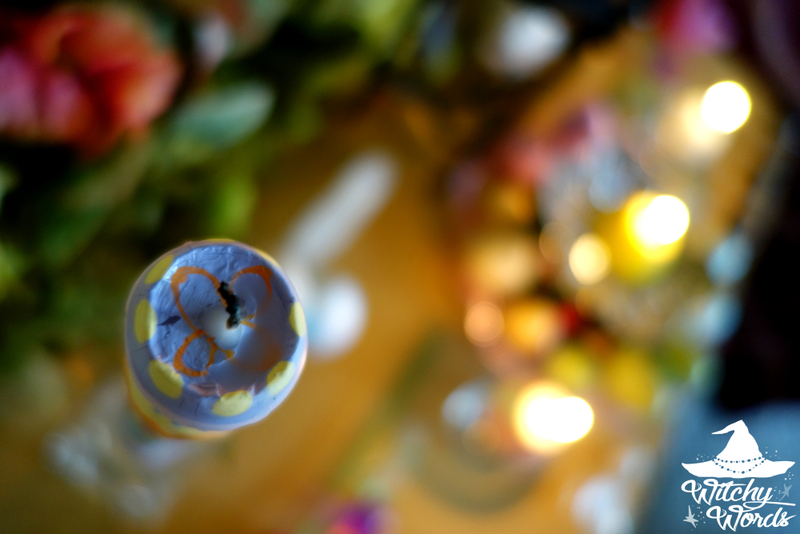 In addition to being fabulous taper candles all on their own, these candles reveal floral designs as you burn them. 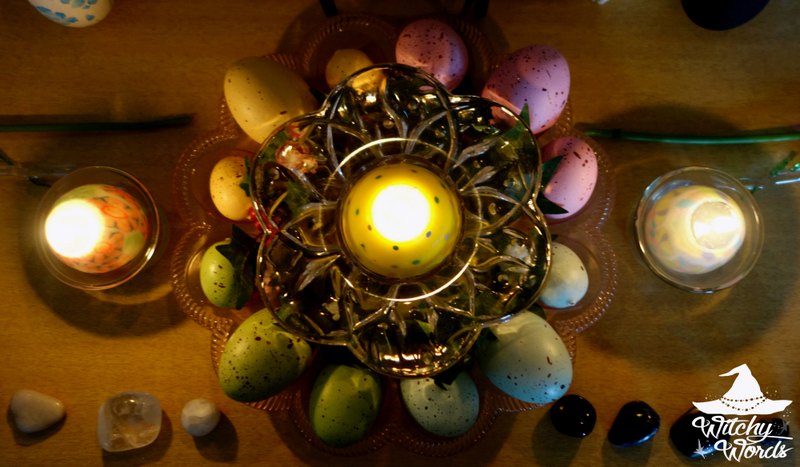 A flower in an egg is a great representation of the life within the seed, making them all the more ideal for this altar. 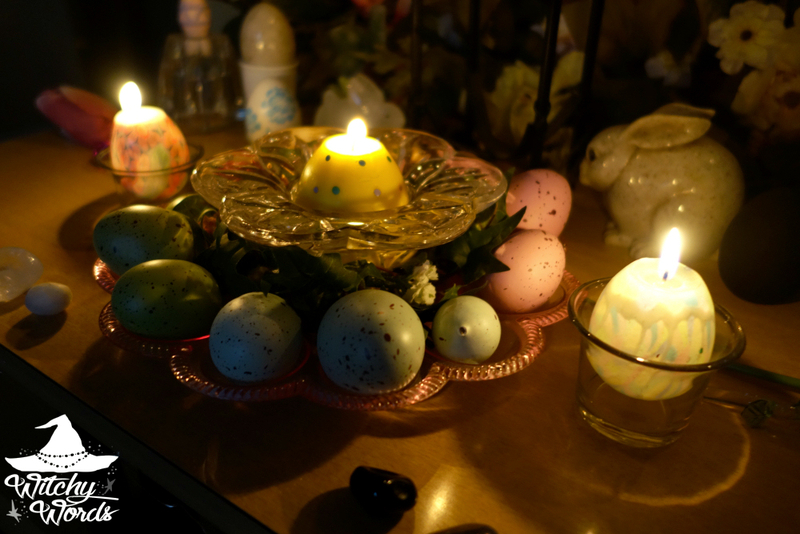 In the middle of my altar, I have more egg symbolism in various candles and faux eggs along with more floral decorations. This set up is important because it gives direction for the rest of the altar. The eggs on the dish are arranged in a way that tells you which direction is east, where the sun rises, and west, where the sun sets. 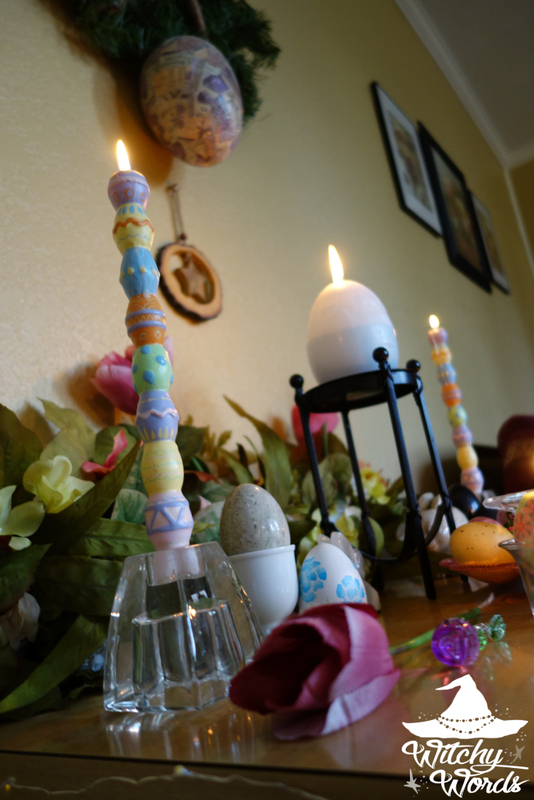 In between the directions, in the center of it all, a glass flower candle holder opens to a bright, yellow glowing egg. This is more symbolism for the birth of life. 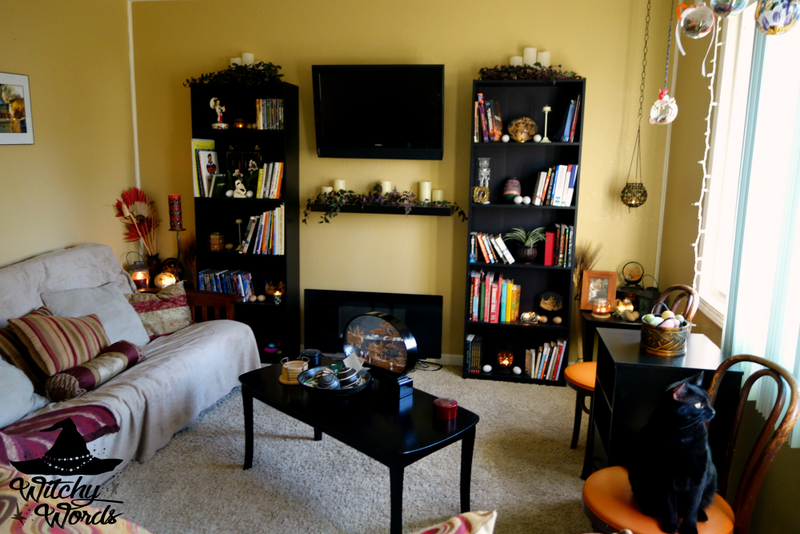 By the way, all of the candles you see on my altar I found at thrift stores for more than a bargain. Even better, none of them had been burned even once! 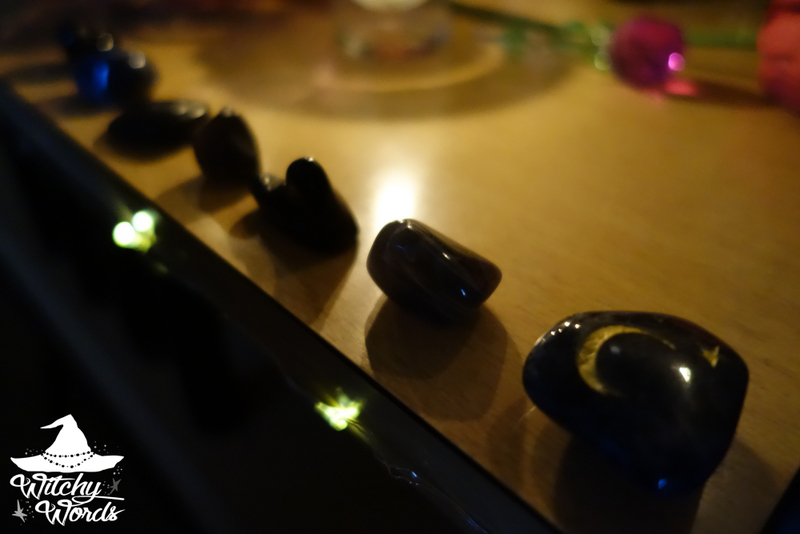 All in all, I spent $6 to add them to my altar and I even have some left over for when these finally burn down. I've always been an advocate of spending less for more when it comes to your tools of the craft and this is a fitting example. While you technically need no tools at all to practice, should you want to invest, there's no need to go broke. Check out thrift stores, support your local metaphysical shops, and buy from reputable online sellers. It will make your life easier! Now back to the altar. ... eggs, and even rabbits. Rabbits are a pretty substantial part of the spring equinox as well. Rabbits are a clear fertility symbol - just think about how many kids these fuzzy little critters pop out! Not to mention that hares can actually conceive a second litter while still pregnant with the first. Talk about multitasking. It's no wonder then that we often associate rabbits with this time of year. 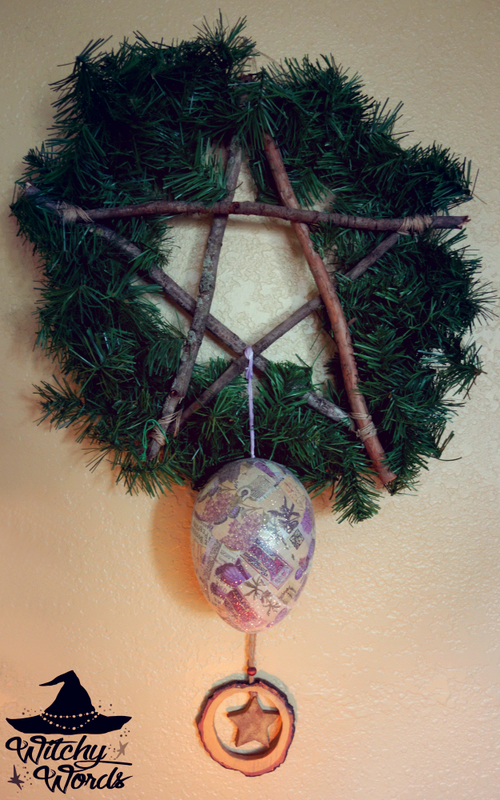 Above the altar, I've hung a paper mache decorated egg from my usual pentacle wreath (find out how to make this wreath here!). 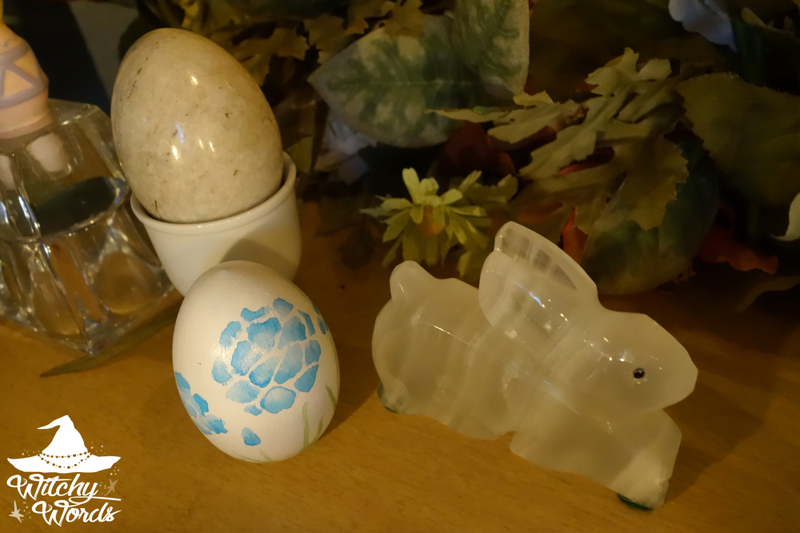 I adore this egg I bought on sale from our local craft store a few years ago. It's probably one of my favorites. 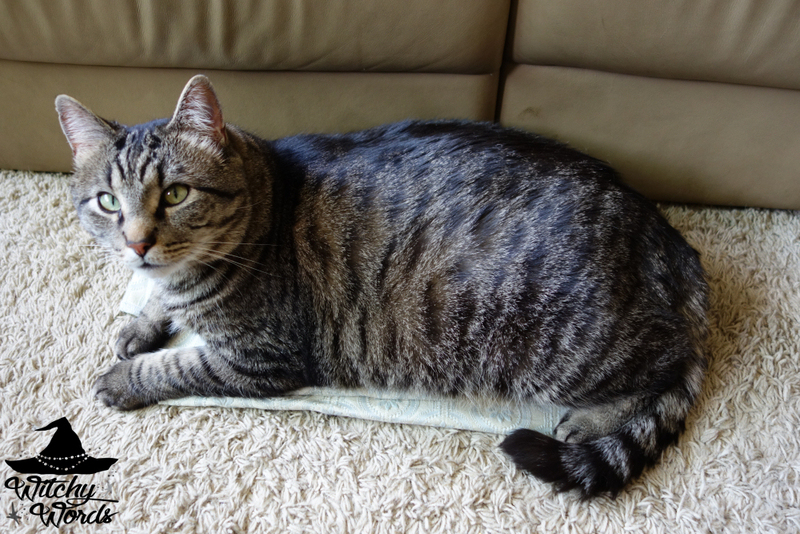 Typically, I like using an altar cloth for my Ostara altar, but someone commandeered it as a bed while I was working and only moved after I'd finished the altar. 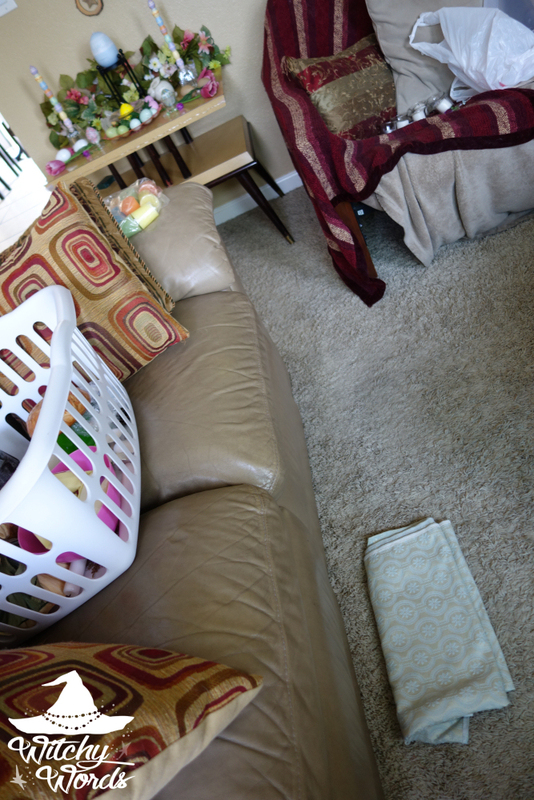 I took Zeus's laziness as a sign that I just didn't need an altar cloth. And honestly? I really like how the altar turned out without it. That's what familiars are for. 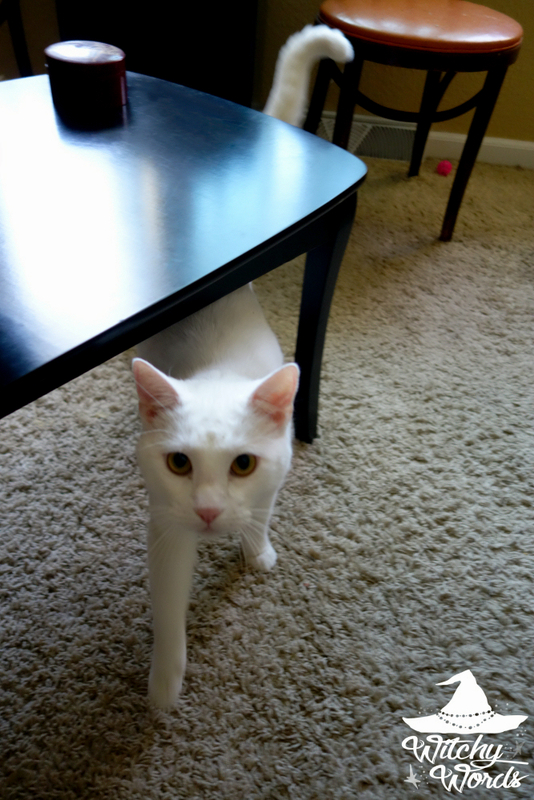 ... And even sassy white cat, Hermes. It seems everyone was in a festive spring mood today! 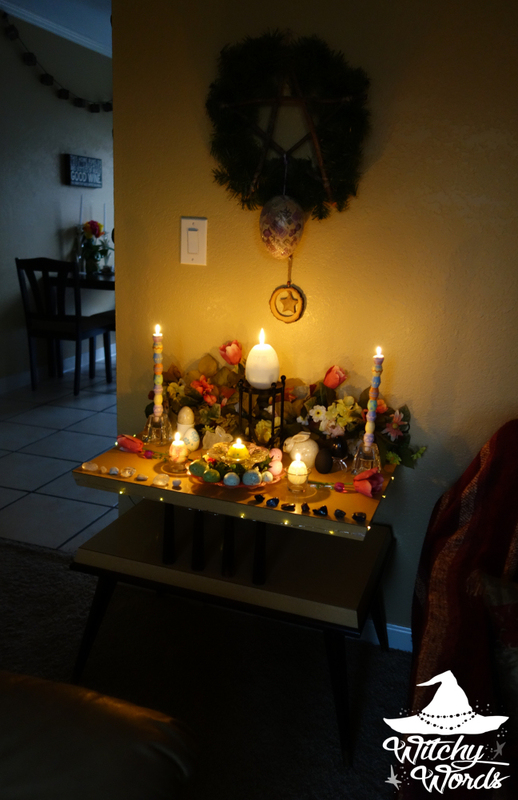 The decorating didn't stop at my altar either. 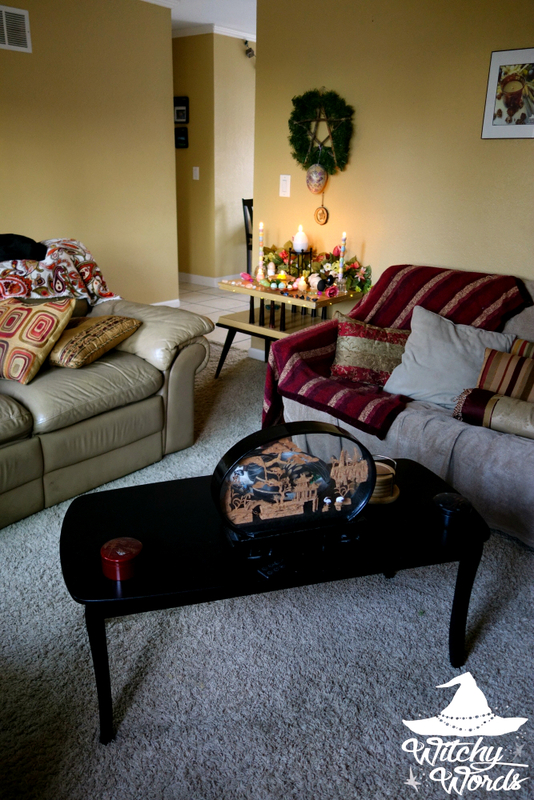 After Yule, I took down our tree and some of our decorations, but I left up the more secular winter ones, like some of the garland and our golden glitter snowflakes. 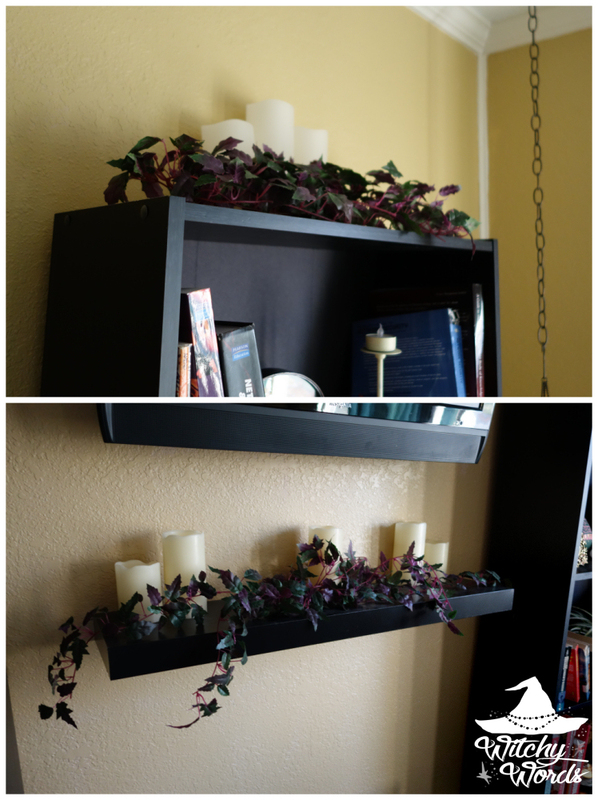 Today, those came down as well and were replaced with floral vines and ivy. 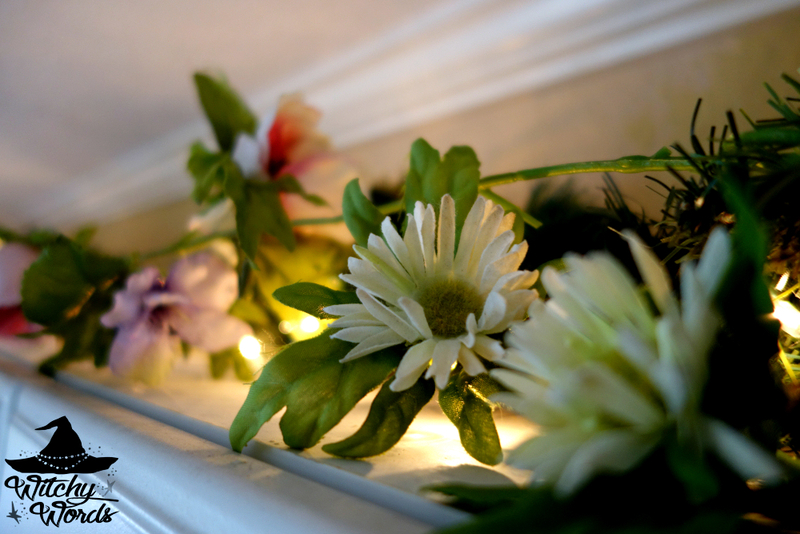 Our shelves were filled with spring equinox symbolism as well to represent the season. 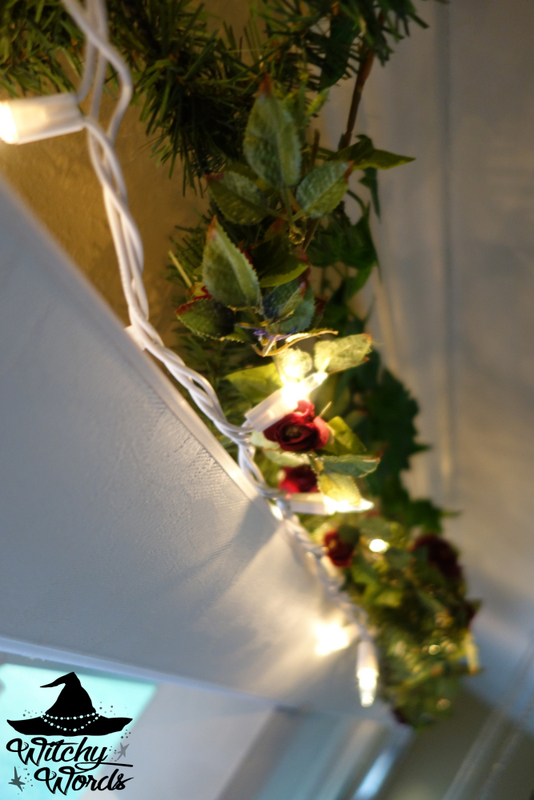 I even replaced the garland over our window with a rose vine. 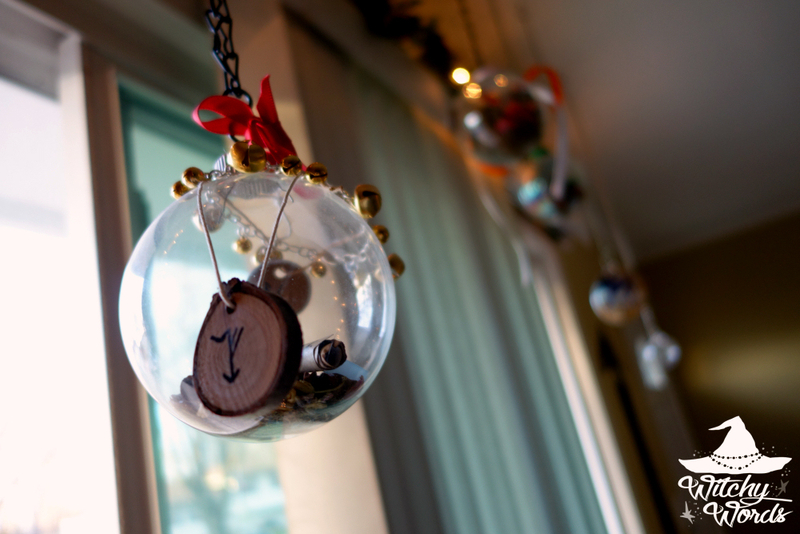 And I finally got around to hanging our Yule ornaments (I'm just a touch behind, as you can tell). 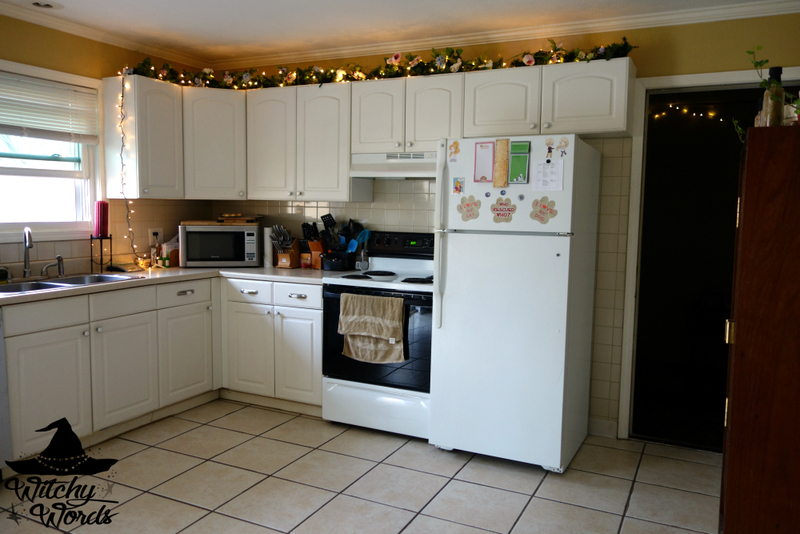 In the kitchen, I replaced the garland over our cabinets with spring flowers. 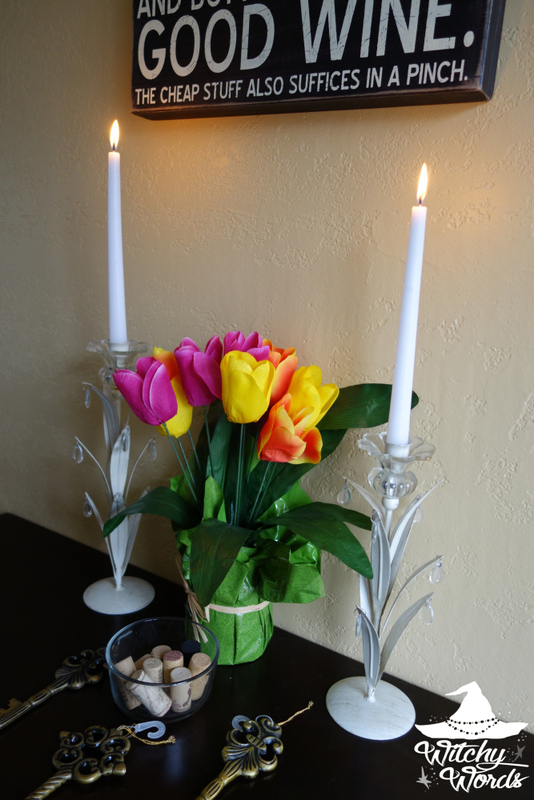 I even added a little spring to our kitchen table. 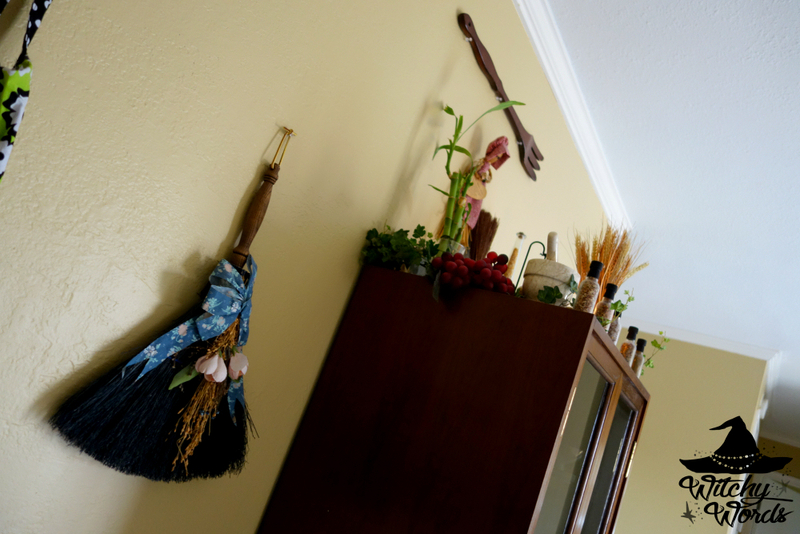 And I was finally able to change out the mini-besom in the kitchen from the fall/winter to the spring/summer one. 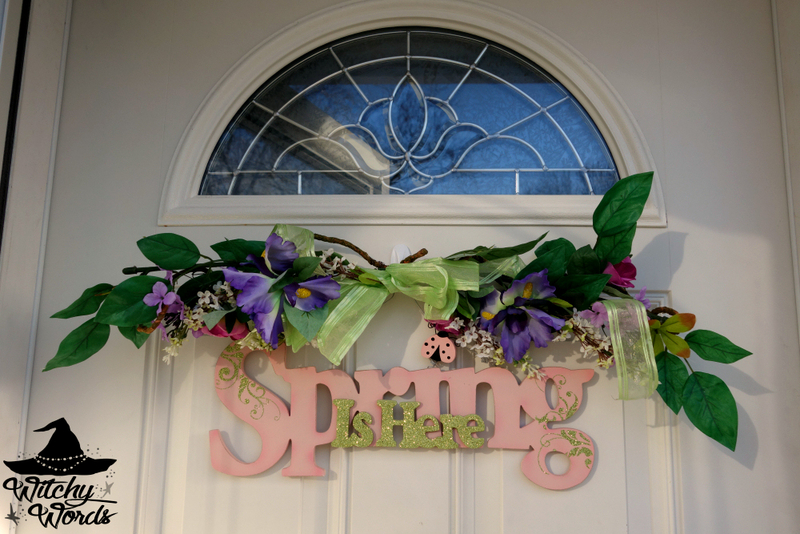 Even our front door got a little touch of spring. 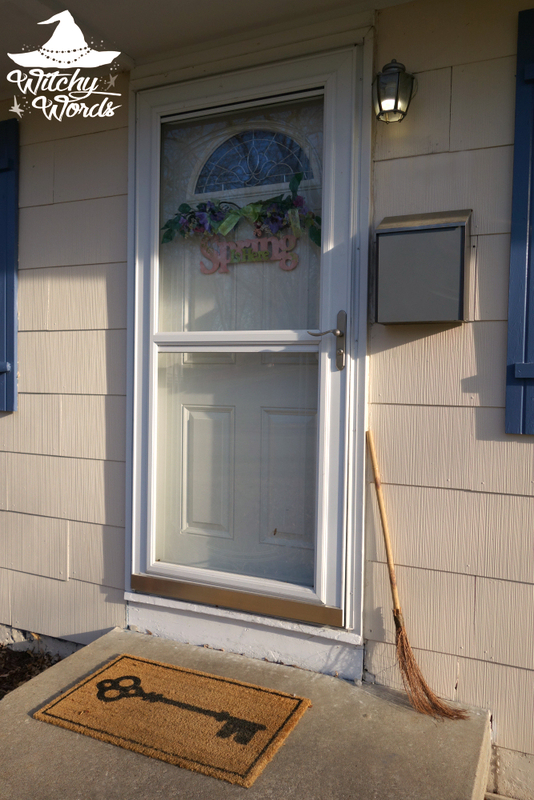 All in all, it was a productive day of cleaning, decorating and airing out the house. Kansas City recently had a very cold, rainy little stint of weather so the 70F sunny day we had was a welcomed relief. Definitely spring-like weather for the spring equinox. 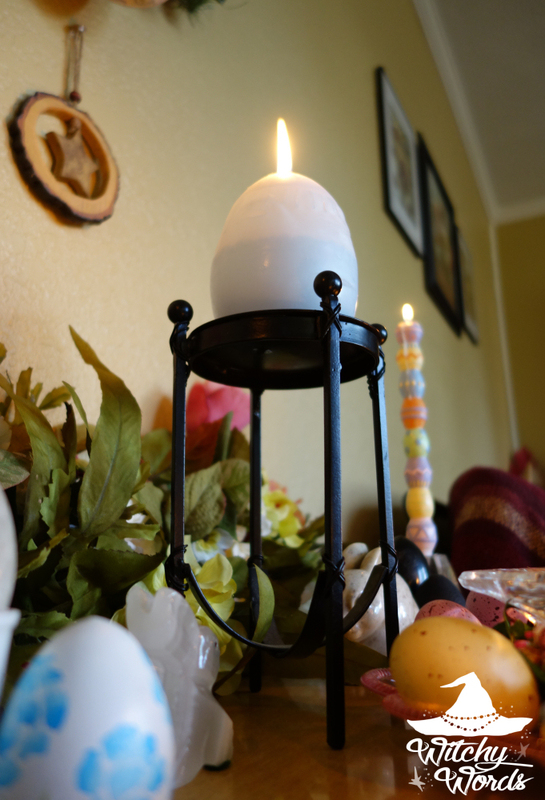 As a side note, Liithi Lushede Coven's Ostara ritual photos will come on March 30th. This year, they've pushed back the ritual to March 29th, so it's coming a little later than usual but it is happening. So more spring to come! 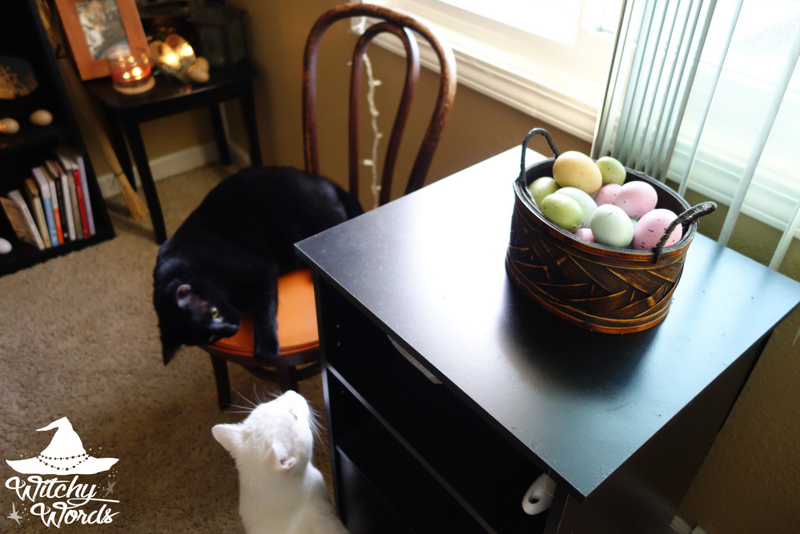 I hope everyone had a fantastic Ostara! Beautiful altar! Thanks for sharing.